Among his accomplishments during his first year in office was delivering a balanced state budget with no new taxes or fees and establishing full day kindergarten. Additionally, Governor Sununu doubled funds to fight the opioid crisis, made investments in clean water projects, expanded educational opportunities for students, and signed job creating business tax cuts into law. 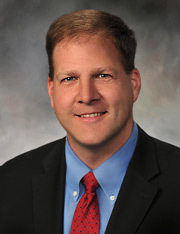 Governor Sununu received the New Futures' 2017 President's Award for championing policies that improve the health and wellness of all Granite Staters. He is the Lydia's House of Hope 2017 Lebanese Cook-Off Winner. Prior to the Waterville purchase, Chris was an owner and Director of Sununu Enterprises, a family business and strategic consulting group. He focused much of his time on local, national, and international real estate development, venture technologies, and business acquisitions. Chris grew up in Salem, NH. He graduated from Massachusetts Institute of Technology (M.I.T.) with a BS in Civil/Environmental Engineering and worked for ten years cleaning up hazardous waste sites.